The Art of ‘Survivance’ Joel Bernstein ’57 brings his passion for Native American art to W&L with a groundbreaking new exhibition. “Those of you who are students here probably don’t know yet what you are getting out of this school,” said Joel Bernstein ’57 at the Oct. 17 opening of “Ancient Inspirations: The Pueblo Pottery of Lorraine Gala Lewis and LaDonna Victoriano.” Clad in a wide-brimmed hat, cowboy boots and dark blue jeans, Bernstein made the groundbreaking exhibit possible — and it was a gift of gratitude. “My whole life I owe to Marshall Fishwick [W&L professor and founder of its American Studies Program] and my career at W&L,” he said, explaining that it was Fishwick who inspired the Queens-born, Baltimore-raised Bernstein to pick up and move out West, where he would forge a career as an educator, author, rancher — even a rodeo performer for a spell. During the 50 years Bernstein spent in Wyoming, Montana, Arizona and New Mexico, he developed a passion for Native American cultures and art; in fact, Bernstein taught a course on Native American art for over a decade at the University of Montana. 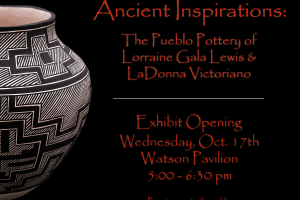 An avid collector, he forged friendships in New Mexico with Lorraine Gala Lewis and LaDonna Victoriano, renowned Native American potters. 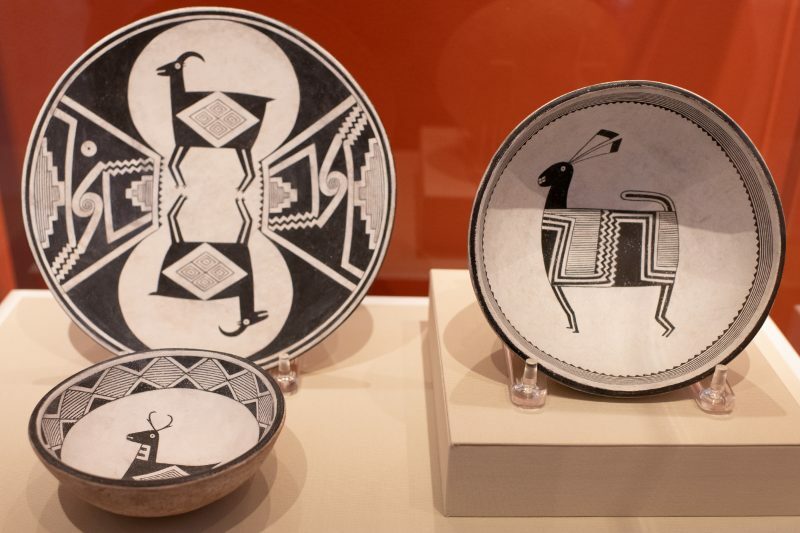 When he learned that W&L’s Reeves Center had never before held an exhibition on Native American ceramics, he realized it was time for these two worlds to meet. Indeed, though the artists are contemporaries and their work shares a resemblance in many of its forms and exquisite black adornment, the two represent distinct traditions. Lewis, who is of Laguna, Taos and Hopi descent, painstakingly recreates the works of her pre-Columbian ancestors, a labor of love, reverence and cultural preservation. “I try to capture the aesthetic beauty and individuality of each piece and remain as close as I can to the original works of art,” she said. Victoriano is from Acoma pueblo, west of Albuquerque, accepted by many scholars as the oldest continuously lived-in place in America. Her work is a modern reinterpretation of the symbols, themes and techniques adapted from several regional tribes. “Ancient Inspirations,” which will remain on display through late February, has touched many areas of the university, as well as people’s lives. For Bernstein, it’s a way to bring his passions for Native American art and history to his alma mater and the wider Rockbridge community. For New Mexico-based artist Victoriano, the opening prompted her first journey east of Omaha. Julie Ruth Malone ’18 helped Ron Fuchs, Reeves Center curator and manager, design the exhibit for an independent study. The experience inspired her to reconsider a legal career in favor of a new one — curating. 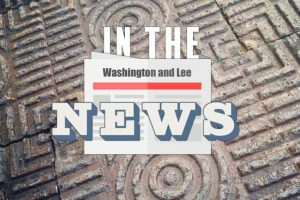 “It helped me realize that I can combine my passion for museums with advocacy work, utilizing institutions of public education as promoters of culture change,” she said. Today, Malone is a programming guide at The Children’s Museum of the Upstate of Spartanburg, South Carolina. Lorraine Gala Lewis’s reproduction pieces, an homage to her ancestors. Lepage reflected on the invaluable experience for her students: handling the art objects and learning firsthand from the artist about techniques and inspirations. “Lorraine Gala Lewis’s presentation reinforced many of the themes we had discussed in our classroom — the importance of origin stories, the ways artists respond to and adapt traditional artistic motifs, and the use of art to preserve and pass down ideas, histories and knowledge within communities,” Lepage said. Joel Bernstein and his wife, Gail, recently established a generous scholarship endowment at Washington and Lee, with a preference to support underrepresented populations on campus. More details on the Gail S. and Joel H. Bernstein ’57 Scholarship will be announced soon.